I can’t seem to get in the zone at the moment. And I’m definitely going way over my syn limits pretty much every day. I know what I’m doing wrong, but I can’t help myself. My only mitigation, and the one thing that stops me going crazy, is to keep going to my Slimming World class. I might be maintaining or gaining, but I know if I didn’t go to class I’d be way worse! So by keeping going to class I can hopefully keep in a holding pattern, until I find my mojo again. 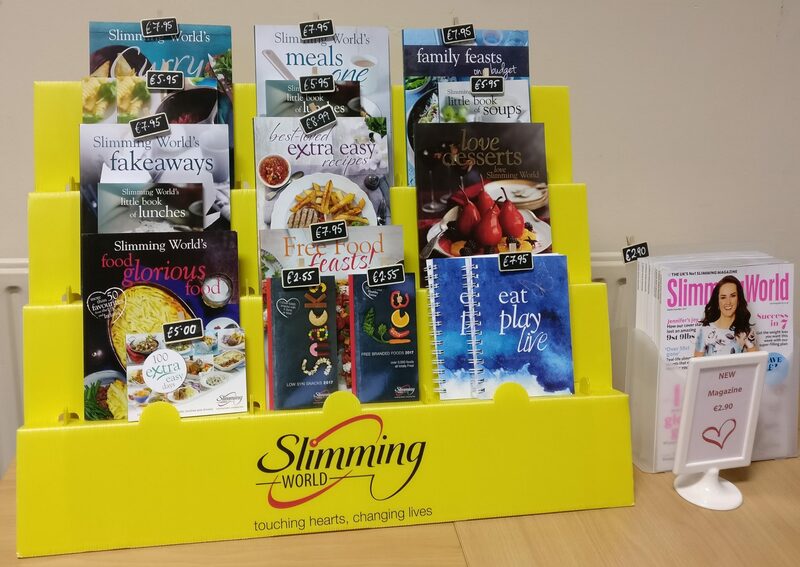 What’s for sale at your Slimming World class? Unlike a lot of diets or healthy eating plans, Slimming World isn’t about getting you to buy their products. There are no shakes to buy, and no ready meals that form a mandatory part of the plan. You can food optimise without having to buy anything from Slimming World themselves. However, they do have a small number of products for sale in class that you can buy. Most notably they have things called Hi-Fi Light bars, which are sold in boxes of 6 for €3.00 a box. You can have two of these bars every day for your Healthy Extra B (HEB), which is great if you have a sweet tooth, or if you use your HEB on something else, they are 3 syns each. The bars seem to be very popular, and often provoke heated debate – especially when the flavours change. As far as I know these bar are only available to buy in class. Some classes may also sell packets of Scan Bran – or Scandinavian Bran Crispbread to use its actual name. Scan Bran often divides people. Some love them. Some hate them. Personally I quite like them, especially with some Laughing Cow Light spread over them and a slice of ham. Scan Bran is available to buy in some health food shops, including Holland & Barrett. There’s often a number of different recipe books for sale, if you’re looking for inspiration on what to cook. They’re often themed around one area, such as curries, desserts, or fakeaways (Fake Takeaways – the taste of a takeaway meal without the syns). New books are occasionally given away for free as part of a promotion, typically when you sign up to a 12-week Countdown – but check with your consultant first! The monthly Slimming World magazine also seems to be quite popular, and is sold in class more cheaply than it’s available in the shops. There are some pretty good recipes in the magazine, along with motivational articles. There’s even a small men’s section, focusing on men’s issues! Last year Slimming World announced an exclusive deal with the Iceland supermarket to sell a range of frozen ready meals. There’s no requirement to buy any of them, but they can come in handy if you’re in a hurry or stuck for ideas. And best of all, I think all of them are syn-free. And unlike a lot of other ready-meals on the market, their portion sizes are quite decent, so you feel like you’ve had a proper dinner! I’ve only tried a couple of them, and find them to be a mixed bag. I didn’t like the sausages at all, but loved the Chicken Tikka Masala. Because of the exclusivity deal, other supermarkets aren’t allowed to sell products that claim to be Slimming World friendly, although it seems that some of the value supermarkets are starting to bring out products that end up being syn-free, even if they can’t sell them as such. So for now it’s down to word-of-mouth to find out about them.